"Just a big thank you to you!! Our people enjoyed your performance very much. It is so refreshing to see people enjoying, smiling and even crying over happiness. We are planning another tour in July and I think we will have repeats. Keep up the good work." December issue of Group Leaders Magazine. "William, Just wanted to let you know your performance and the lunch were an OUTSTANDING success. My assistant returned completely elated about the trip and said they all loved it and want to do it again." "First I would like to tell you again how very much we enjoyed your entertainment! Our group was singing your songs on the bus! They all loved it!" "Hi William, Just wanted to let you know that I spoke to my group leader about their trip and they are rating it 5 Stars. They just loved you and your show - your performance was the best. The Village Inn was great and the food was excellent, this day trip was very rewarding to them." 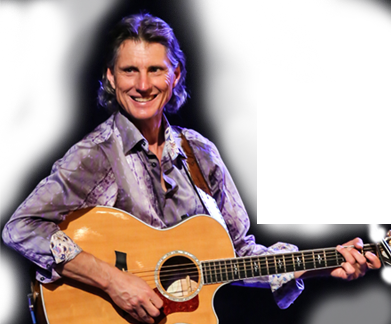 Expect sitting back, singing along, and enjoying the songs of the 60's, The New Christy Minstrels, Peter Paul and Mary, John Denver, and uplifting, inspiring original songs presented with amusing stories in a heart warming, fun and intimate show. Bus Tours are in Northern California one hour north of San Francisco. Bus tour options include visits to wineries, Russian River area, majestic Armstrong Woods redwood forest, Sebastopol and Guerneville shopping, breathtaking northern California coastline, and more, topped off with a fine dinner and William's show. Great Italian food. Casual Italian atmosphere. This California Delta landmark is located three miles south of Walnut Grove, on scenic State Highway 160. 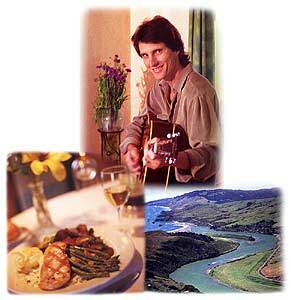 You will find the hotel in its peaceful setting on the orchard-lined banks of the Sacramento River. Great attractions near by including eco river tour. 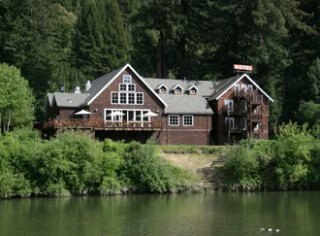 Charming Inn among the redwoods alongside the Russian River. Meal and Show inside the warm dining room and fireside lounge or on the Cabana Terrace outside, overlooking the beautiful Russian River. Dine amoungst the antiques in the historical charming Jenner Inn. A Beautiful setting where the Russian River meets the ocean. An old historical charming favorite spot of local senior groups nestled in a garden setting amongst the redwood trees. It is close to shopping, San Rafael Mission, art museums, and other attractions. Inviting, intimate dining room on a hillside overlooking the water. Let us help you put together a fun and relaxing itinerary for your group! Prices starting as low as $34.00 per person, includes meal, tax, tip, and show. Step on guide (optional) adds humor, information, and stories of the local area to your bus tour. Starting at $150. Promo kit, CD, and concert video sampler are available upon request. "We had a great time, everyone enjoyed it. You were at your best! It was a great, great day. What a pleasure it is to work with you." "You did an awesome job for our group! Obviously everyone loved the show by the way the CD and tape sales went over. Mark your calendar for next year's big event!" "What a great success the luncheon and your show was. We want to do it again next year!" Photo courtesy of Jenner Inn.